Benjamin West was born in a house that is now on the campus of Swarthmore College, in Pennsylvania. West told the novelist John Galt, he collaborated on a memoir, that, when he was a child, Native Americans showed him how to make paint by mixing some clay from the river bank with bear grease in a pot. Benjamin West was an autodidact; while excelling at the arts, he had little formal education and, even when the president of the Royal Academy, could scarcely spell. From 1746 to 1759, Benjamin West worked in Pennsylvania, painting portraits and in 1756, at the age of eighteen, his patron, the gunsmith William Henry, encouraged him to paint The Death of Socrates based on an engraving in Charles Rollin's Ancient History book. 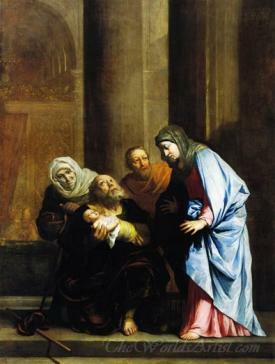 One day, while visiting Henry, the College of Philadelphia's provost Dr. William Smith saw this painting and when told it was painted by the young Benjamin, was so impressed that he decided to become Benjamin West's patron, offering him an education and connections with wealthy and the politically connected. During this time West met John Wollaston, a famous artist who had immigrated from England, Wollaston taught West his painting techniques on how to achieve the shimmer of silk and satin. 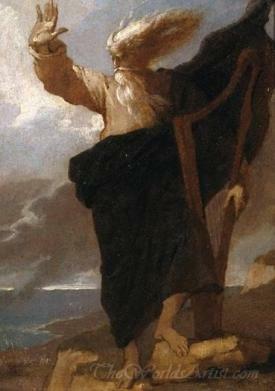 Benjamin West was a close friend of Benjamin Franklin, whose portrait he painted Benjamin Franklin Drawing Electricity From The Sky. Franklin was the godfather of West's second son, Benjamin. Benjamin West, The Birth of the American Neoclassicism. After winning independence in 1776, the artists of the young America still sought inspiration in Europe and continued to train at the Royal Academy in London. But, during this period, a new school also began to emerge and the latest developments in figurative painting were applied with considerable talent to completely novel themes. The main model for young American artists was Benjamin West, who moved from America to London, after a stay in Rome. West, who was elected president of the Royal Academy after Reynolds's death, devoted himself to the depiction of contemporary events ennobled by his high-flown neoclassical style. He invited many American painters to stay in his home and aided them in their development of artists, urging them to make the great European pictorial tradition known in their own country. In 1760, Dr.Smith and the wealthiest man in Philadelphia, William Allen, sponsored West to travel to Italy for him to expand his knowledge and repertoire by copying the works of Italian painters such as Titian and Raphael. In 1763, on his way to America, Benjamin West stopped off in England for a visit, he stayed and never returned to America, in London, he was introduced to Richard Wilson and his student Joshua Reynolds. 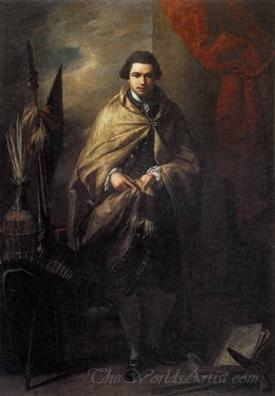 In 1766 West painted Portrait Of Colonel Guy Johnson, Johnson was the English official in charge of Indian affairs in the American colonies and, on his return to England, he took with him as his secretary the chief of the Mohawk tribe, idealized here with his benevolent expression as a typical "noble savage". Some details of the colonel's clothes such as the moccasins and feathered hat are also Indian. 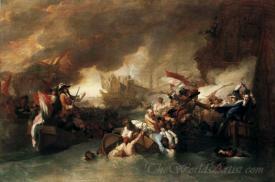 King George III patronized West and the King's first commission from West was a painting of The Departure of Regulus from Rome. West soon became friends with the King, and the two of them would have long discussions on the poor state of the arts in England and the idea of the establishing a Royal Academy of Art for the training of artists. The Academy came to fruition in 1768, with West one of the primary leaders of an opposition group formed out of the existing Society of Artists of Great Britain. Joshua Reynolds was its first president. 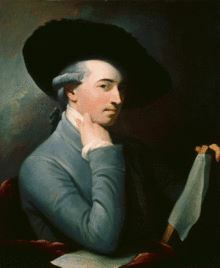 King George appointed Benjamin West in 1772, historical painter to the court at a monthly salary of £84.00 (equivalent to US$12,000 today). He painted a series of eight large canvases showing scenes from the life of Edward III for St George's Hall at Windsor Castle and proposed a cycle of 36 works on the theme of "the progress of revealed religion" for a chapel at the castle, of which 28 were executed. Benjamin West painted in 1770, his most influential and famous oil painting The Death of General Wolfe, exhibited at the Royal Academy the following year, this the painting became one of the most reproduced images of the period. 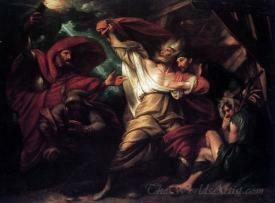 Artists Influencing Benjamin West: John Wollaston. He Traveled To England, Italy. Painters Benjamin West Influenced: Ralph Earl, Samuel Morse, Robert Fulton, Charles Willson Peale, Rembrandt Peale, Matthew Pratt, Gilbert Stuart, John Trumbull, Washington Allston, Thomas Sully, John Singleton Copley. 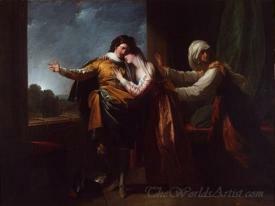 Benjamin West Hand-Painted Oil Painting Reproductions. Benjamin West Museum Art Replicas on Canvas.